Hi pals, what’s in store this weekend? Sarah and I are getting into the Halloween spirit. 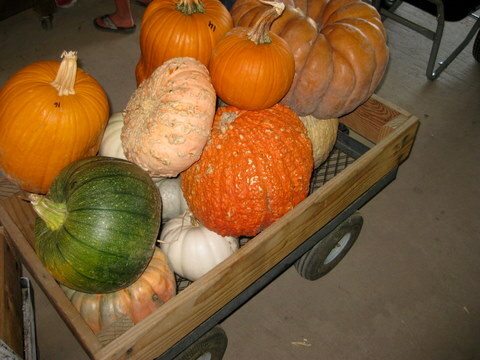 I’m planning to visit a pumpkin patch to pick out the perfect Cinderella Pumpkin to decorate at my friend’s pumpkin carving birthday party. 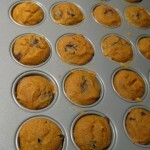 I think I’ll bring my famous mini pumpkin chocolate chip muffins. Dense and deeply pumpkin and spice flavored to celebrate the season. 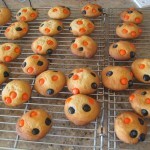 I might also make our mini Halloween cookies by substituting the chocolate chips in a standard chocolate chip cookie recipe for black and orange M & M’s as seen above. These are irresistible, I want to eat the picture. 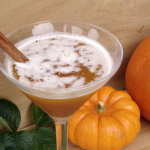 I’m dying to try this Jack-O-Lantern Martini (a Manhattan with hints of pumpkin, apples, and fall spices) created by my friend Jason of The Thirsty Scientist. His mobile mixology services were featured on The Kitchn blog this week! I hear he may have an opening still for Halloween weekend if your party wants to chic it up a notch. 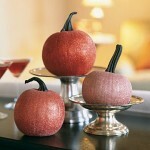 I heart Martha Stewart glitter crafts (as seen here) so much that I actually made these glitter pumpkins 3 years ago and highly recommend the project. Mine are not a prefect as Martha’s but I was still proud of myself. Wishing you all a crisp and cool weekend. Jack-O-Lantern Martinis AND M&M cookies in one post? Be still my autumnal heart. 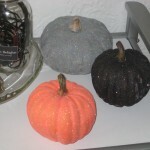 Your post is getting even me in a festive mood! thanks Ladies, this is a wonderful season isn’t it!